Captivating and affordable artwork is made every week in an unusual art studio in Bridgeport. The artists themselves are an extraordinary blend of people from across the area. Many are on the autism spectrum; others have been challenged by mental illness. All of them create memorable art that gives them a lot of professional pride—and a little bit of money. Phil Ponce: The first thing you notice is the quality of the work. Next, you notice the variety. Looking for a handcrafted scale model of Wrigley Field? Or maybe Hogwarts? How about a painted tribute to an esteemed American artist? Or glittery portraits of politicians, TV personalities—or both? Maybe you’re in the market for something that defies categories. All can be found in a fourth floor corner of the Bridgeport Art Center. It’s a workspace that provides adult artists with supplies, guidance and opportunity. This destination for creation is called Project Onward. Robyn Jablonski, studio manager: Project Onward is a studio and gallery for adult artists with developmental disabilities and mental illness, and we provide our artists with space and materials, and the artists—we have about 50 artists —and the artists sell their artwork. All the artwork is for sale, and 50 percent goes directly back to our artists, the rest goes into the program for cost. Each artist is really unique, and they’re unique in their personality, they’re unique in their style of work. So we try to go with that and keep honing in on that uniqueness in their work. We do not teach our artists. Our artists are professional artists already because they come in with a full portfolio. They have their own concepts and themes already and what we do is, we give them commissions and we set business goals for them, career goals for them where we kind of shape and mold the work that they already have. Ponce: We met one of the artists, who contributed a portrait of the painter Jean-Michel Basquiat for an upcoming show. George Zuniga, artist, Project Onward: Right now I’m doing Basquiat. 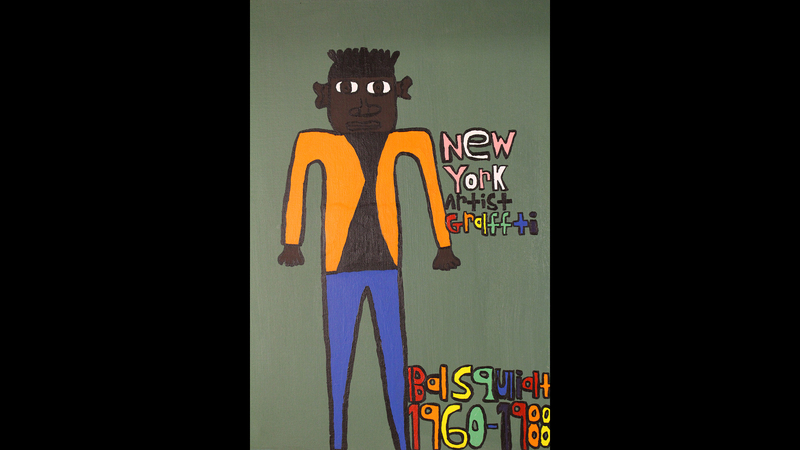 Before that I didn’t even know Basquiat, he was in New York and I didn’t know that he had died in 1988. That’s very strange. Ponce: Another artist is equally adept at painting, sculpting or sewing. She’s grateful for the artistic sanctuary that Project Onward provides. Elizabeth Barren, artist: It was a joy, it really was, the open heart of receiving me and my work due to the fact that I’d taken it other places and was rejected, and that caused me to go in a closet with a lot of my art and paintings and I’d just do them and stack them up and put them away. But Project Onward has truly been a great help and I’m glad to be here to help out with other artists as well, get great ideas. Ponce: After a devastating car accident last summer, Elizabeth Barren couldn’t wait to return to work. Barren: Every day I pressed and pressed, I gotta get back to Project Onward, I gotta get back to my art. It’s really a joy. It gives me strength. It gives me peace. Ponce: The art is priced to sell. We found small works for just a few dollars and ambitious sculptures for about $100. It began in 2004, when young artists were aging out of a city of Chicago after-school program. Project Onward was established as a nonprofit and moved to the Bridgeport Art Center in 2013. Now it’s a magnet for talent. Jablonski: They’re coming from all over the Chicagoland area, we have artists from as far south as Frankfort and as far north as Skokie right now. Some artists take public transportation, some get rides, some drive—it’s all different. We get artists, a couple artists usually every other year. We’re pretty much at capacity right now, but if there is an artist that is exceptional and we think they’d be a great fit for the program, we will take them on. And usually, once they’ve gone through that trial period, they remain with us for, indefinitely. Zuniga: Look at it, see? This is soon to become a masterpiece. And I do mean masterpiece. Jablonski: Our artists are artists who are sometimes outside of the general public or the neuro-typical, right? So it’s a way of connecting with people that are on the spectrum or deal with a mental illness that you don’t, normally don’t get that intimate look into living with that. Barren: It’s life, it’s love, it’s a lotta joy here. If you look around, look at all the amazing art that comes out of us. Project Onward hosts a VIP reception Friday at the Bridgeport Art Center for an exhibition that honors African-American artists. The artists of Project Onward will be in attendance. Jan. 10: On Chicago’s West Side, an artist-run production weaving mill and a social service agency work together to weave adults with intellectual disabilities into the fabric of their community.